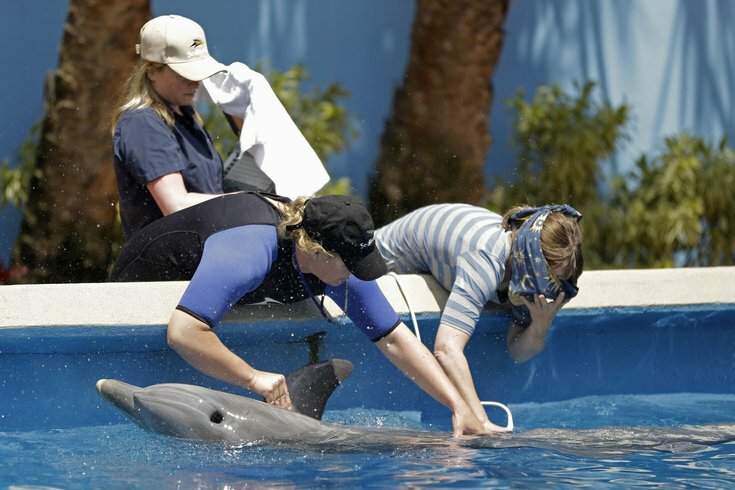 In this April 10, 2014 photo, Dr. Michelle Davis, right, with the help of trainer Aubrey Taylor,front left, and veterinarian technician Carmen Peccie work together to get a sonogram on Bossa the dolphin at Sea World, in Orlando, Fla. Visitor at SeaWorld's theme park in Orlando, Florida, will no longer be allowed to feed the dolphins. As of now, visitors are still able to touch and pet any dolphins that approached them, but the park is no longer selling $7 trays of fish to entice the aquatic mammals, the Orlando Sentinel reported. Starting next month however, guests will be able to buy 10-minute packages — starting at $15 a person — that include touching the dolphins and having photos taken with them under a trainer's supervision. A SeaWorld spokeswoman told the Orlando Sentinel that the new program is similar to popular ones in SeaWorld's San Diego and San Antonio parks. Animal activists and some weary parents are applauding the decision, both for the safety of the animals and their children, the latter of which was brought to media attention in 2012, after a father captured video footage of a dolphin launching up and biting his daughter’s arm during a feeding at the Orlando park. The incident prompted PETA to request the US Department of Agriculture investigation the situation.